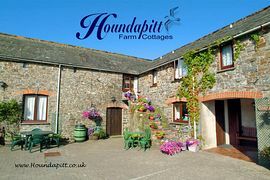 Houndapitt Farm is set in a 100 acre estate with stunning views overlooking Sandymouth Bay. Formerly 19th Century stables and barns, this tasteful conversion has retained much of its character. The large paved courtyard is decked out with a blaze of colour in the summer. 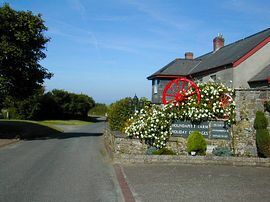 Each cottage has it's own parking space adjacent to the cottage, and overflow parking is available. 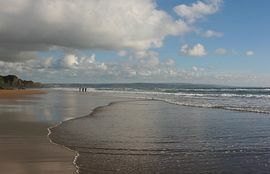 All around are Picturesque breathtaking sea and countryside views in this peaceful part of Cornwall. Our large games room (15mx 9m) has many games including pool and table tennis. Here, especially the children make great friends. In the games room you will also find the free video library. The adventure playfield has swings, a giant slide, playhouse, and the ever-popular trampoline. Close by is the brick built barbecue with picnic tables and benches an ideal place to watch uninterrupted views of our spectacular sunsets. The nearby fishing pond is stocked with various carp, golden tench and golden rudd, it's great fun for all, for all ages and it's free! An adult must accompany Children under the age of 11 years. 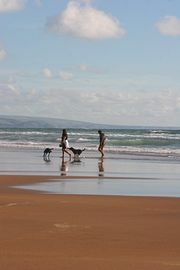 Enjoy the thrill of Sea Fishing from the beaches and cliffs. The Laundry facilities include a coin operated washing Machine and tumble Dryer, Iron and Ironing board. Close by we have the outdoor drying area. Next door you will find a payphone. 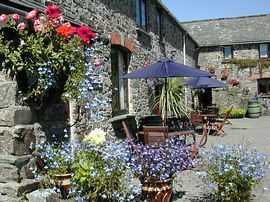 All Cottages are superbly equipped providing exceptional value for money. All our accommodation is of a high standard with all the comforts of a modern home, all rooms are heated (which is included in the price) giving a cosy warm atmosphere. Children are always welcome and we are well-equipped for all your family needs, from cots and highchairs to safety gates and baby baths. For your peace of mind all the cottages have a torch, smoke detector, and fire extinguisher. Linen is provided as standard with all bookings. Shared games room along with childrens play area including slide, trampoline and swings. Set on 100 acre complex with own fishing lake! Leave the M5 motorway at junction 27 (Tiverton exit) follow the signs to Barnstaple, then continue towards Bideford and Bude. 4 miles before Bude you will reach the village of Kilkhampton, carry on through the village for half a mile (descending a hill) turn Right at the signpost to Sandymouth. Continue through the small hamlet of Stibb, after another half mile turn left again to Sandymouth Beach. We are just down this road on the Right. From £185 to £1250 per week. To see our up to date availability and prices please visit our website.